It's important to remember that recycling isn't the only way to conserve resources. In fact, it's the last resort in waste reduction. Buying less and reusing what you already have are the best ways to decrease demands on the environment. Reduce, reuse, and then recycle. Much of the waste produced on campus is actually recyclable. 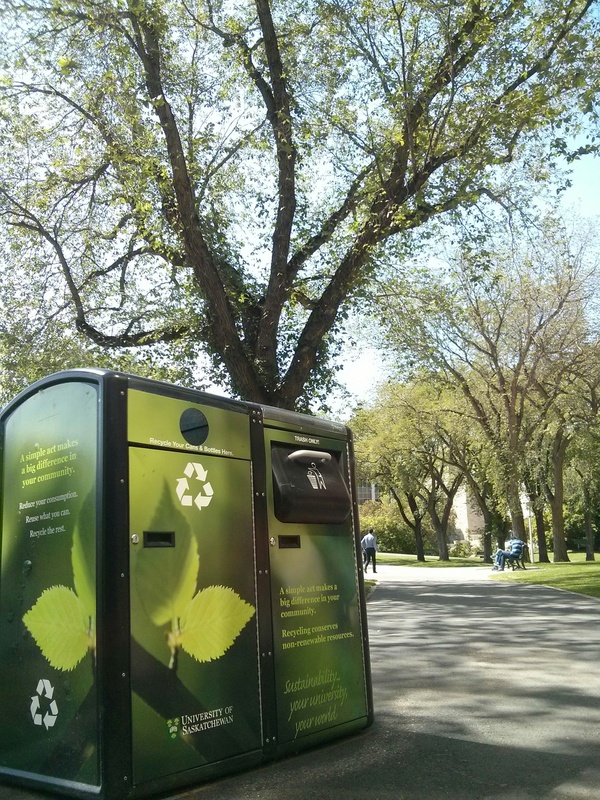 The U of S employs a single-stream recycling program to make it easy for you to reduce the waste generated on campus. Single-stream recycling was introduced on campus in 2012 to make recycling easier and more accessible for everyone on campus. Any revenue from the recycling program helps create student jobs and will be directed towards sustainability initiatives on campus, including the expansion of our program to include other materials. Recycling takes the strain off of our waste disposal system and keeps our campus beautiful. You can recycle on campus using the many bins located across the university, including the Big Belly solar compactors (seen at left). Keep an eye out for them and waste less! Don't forget about the recycling bin in your room. McEown Park, College Quarter, and Graduate House residents have a small blue bin in their room. Keep your recyclables here until you're ready to take them into the garbage room or down to the recycling bin outside your building. College Quarter and Graduate House residences take their recyclables to the garbage rooms located on each floor. Here, there are separate containers for bottles and cans and single-stream recycling. Voyageur Place residents can take their recyclables to one of the bins located on each floor. 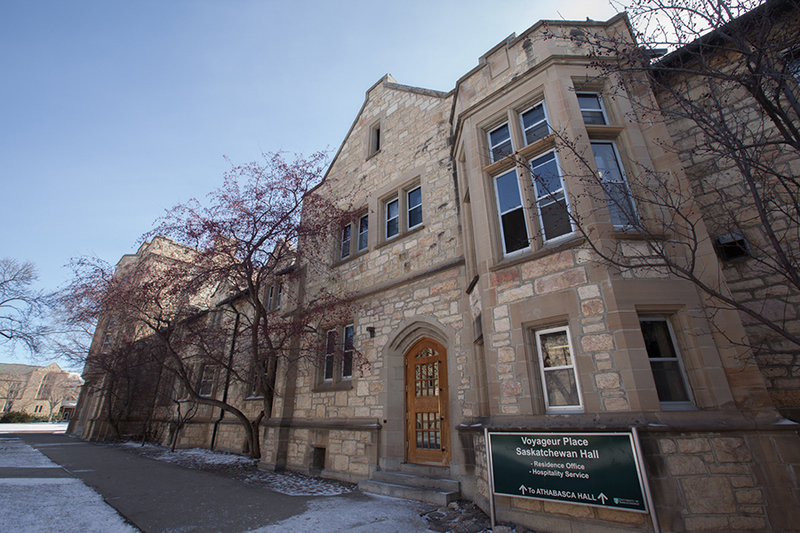 The McEown Park residences (Wollaston, Seager-Wheeler, Assiniboine, and Souris Halls) are some of campus' oldest buildings and thus feature some complications when it comes to waste management. However, they still feature a comprehensive single-stream recycling program just like the rest of campus. *each Friday morning these items will be picked up from the garbage room specifically. check out the 'Sustainability' channel on PAWS. Keep up to date with sustainable initiatives, news, and events going on at the U of S. Customize your PAWS to see the channel on your home page. Did you know that during the regular school term about 8,000 paper coffee cups are thrown away per week? 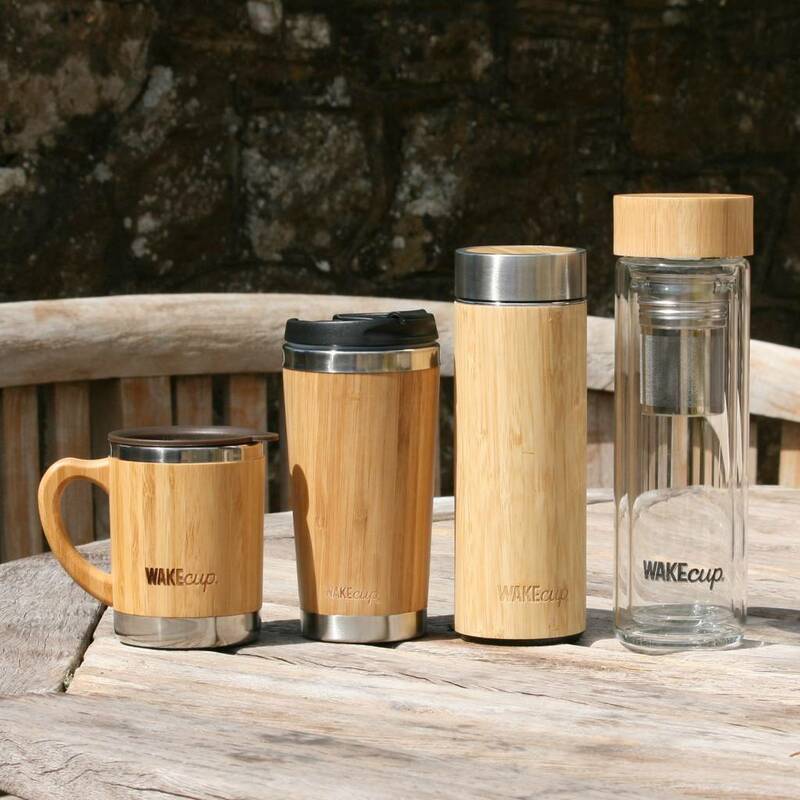 Remembering to bring your travel mug with you can help to prevent a lot of waste over your years at school. Bringing a reusable coffee mug to any coffee vendors on campus will earn you a 10 cent discount on your purchase. St. Thomas More's Choices cafeteria offers a discount on soup if you bring your own bowl or mug. Always ask for a ceramic mug if possible when you are dining in and don't have your mug with you. Print double-sided when printing in a shared computer lab. If you own a personal desktop printer capable of this, make sure that double-sided printing is set to your default in your printer drivers. Only print what you need to and make use of the track changes tool when typing Word documents to avoid printing draft copies. Ask your professors if you can hand in assignments electronically or print them double-sided. Buying used textbooks helps you save money and save paper. Check th ePAWS classifieds for students selling their books. Check the PAWS classifieds for other things being sold or use a site like Kijiji.ca to buy or sell used items. Need to get rid of unwanted items? Drop them off in the free box located in the Arts tunnel. Whatever you don't need, someone else might. Take higher-end clothing to stores that buy used clothes for a little extra cash. Whether you live in College Quarter, Graduate House, Voyageur Place, or McEown Park, there are many ways to reduce your energy consumption while living in residence. A few simple actions can make a big difference! Hang your clothes instead of using a dryer to save energy and money. Drying racks can be purchased inexpensively at many local houseware retailers. Do laundry only when you have enough clothes to fill an entire load. If it takes too long to gather enough clothes, share a load with your roommate. Wash your clothes in cold water. Up to 90% of the energy used when doing laundry comes from heating the water. Cold water gets clothes just as clean as hot water and even helps them last longer. Turn off the lights if you are the last person to leave a room. This includes the washroom, shared lounges, and laundry rooms. Shut down your computer when you're not using it or use power saving modes like sleep or hibernate. Turn off all electronics when you're not using them. Unplug electronics like chargers, gaming consoles, and TVs when you're not using them, as they continue to draw energy even when they're not actively being used (called phantom load or vampire power, which can account for approximately 5-10% of all home electricity use). Plug all electronic equipment—iPod or cell phone chargers, TVs, computers, etc. into a power bar. Turning them all off now just takes a flip of a single switch, easier than turning them all off individually. Screen savers don't actually save energy—they use about as much as when you're using your computer. Turn off your monitor or computer to save energy. Install LED bulbs in any additional lighting you bring. They use about 75% less energy and can last up to 12 times longer than traditional incandescent bulbs. Keep windows and doors closed when you are heating or air conditioning your room. On hot days keep your blinds closed to keep out direct sunlight and reduce your cooling needs. On colder days keep your blinds open to let in sunlight and warm your room. If there's no sunlight keep blinds closed to minimize heat loss and keep cold drafts out of your room. Turn your radiator or thermostat down when you go to sleep or you're away from your room. Students living in graduate house can program their thermostats to save energy. Turn down the heat one or two degrees in the winter and throw on a sweater, or turn down the air conditioning in the summer and use a fan to keep cool. Keep your freezer full—a freezer full of food uses less energy than an empty one. Take advantage of the University Learning Centre. If you live in College Quarter, keep an eye out for the Health and Sustainability Living Learning Community. Offered in the past, the ULC hopes to implement more initiatives in residence. Need a secure place to leave your bike? Bike lockers equipped with a padlock and locking mechanism are available for rent. Every year during Welcome Week, a bike sale is held on campus to get rid of bikes that have been abandoned on campus. The bikes are reconditioned by members of the Bridge City Bike Co-op and sold back to campus. If you have a bike you no longer need, contact sustainability@usask.ca. It will either be donated to charity or fixed up and sold in a campus bike sale. All undergraduate and graduate students have a U-Pass included in their student fees. At 85% less than the cost of a regular adult bus pass, students can ride anywhere. UCommute—accessible through PAWS—allows users to easily find carpool partners as well as biking, walking, and transit buddies. With one-time rid matching, you could even find someone to share your drive home for the holidays. Need to fix your bike? There's a bike repair stand located between the Arts and Thorvaldson buildings. The stand was the first of its kind to be installed at a Canadian university. Bike repair kits can also be borrowed at the PAC with a valid student ID. Try taking shorter showers. Shaving time off your morning shower saves water and energy and cuts down the time it takes to get ready. Turn off the tap when you're brushing your teeth, shaving, or washing your face. There are many new and exciting green initiatives taking place all across campus to encourage healthy and sustainable food consumption. Students staying in McEown Park, College Quarter, or Graduate House over th esummer are able to apply for a plot in the McEown Community Garden. For more information, contact the Office of Sustainability's Community Garden Co-ordinator. The Aboriginal Student Centre hosts a Good Food Market where you can pick up fresh fruits and vegetables. The ASC is located in the Gordon Oakes Red Bear Student Centre. The USSU hosts a Good Food Market in Place Riel every Wednesday and Friday. The U of S Campus Farmer's Market runs a monthly farmer's market in the North Concourse of Place Riel. Local food requires less transportation and supports the local economy. Both Marquis and St. Thomas More's Choices cafeteria use local food in their dishes. Fair trade coffee is available at all non-branded retail locations like Louis' Loft. 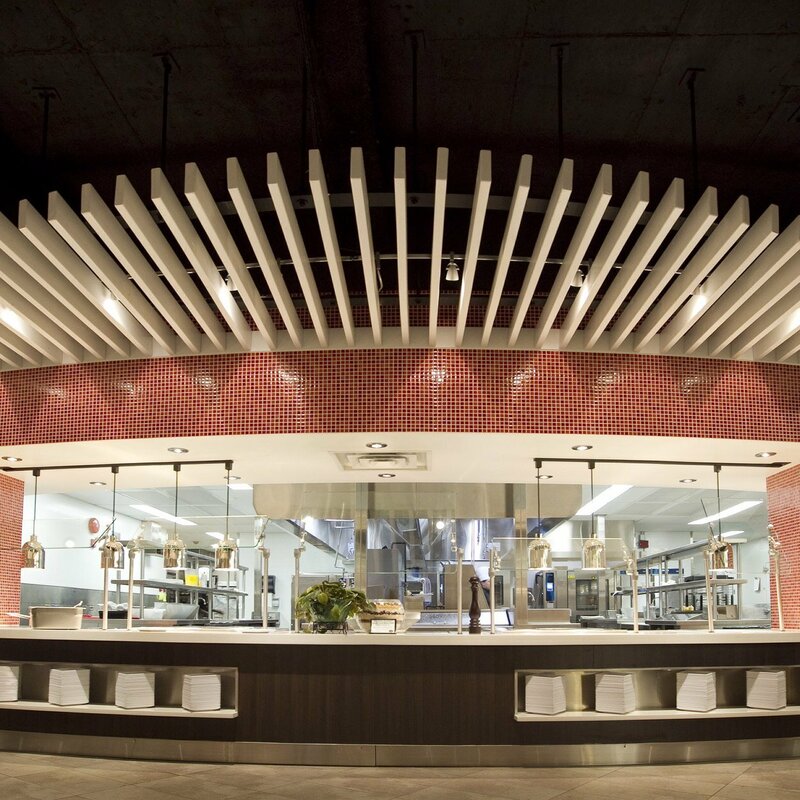 Vegetarian options, which are superior to meat options from an emissions perspective, are offered at may food outlets on campus including Louis', St. Thomas More's Choices cafeteria, and Marquis Culinary Centre. There are also options for other special food requirements. If you aren't sure wha tyou can eat, ask one of the employees. Want to eat green off-campus? The Saskatoon Farmers' Market runs on Saturday from 8-2 and Wednesday and Sunday from 10-3 at the River Landing in Saskatoon's Riversdale neighbourhood.